Following the words of the P.P. Bliss hymn, “Let the Lower Lights Be Burning”, St. Philip’s Episcopal Church in Charlestown, South Carolina, and the First Baptist Church in Beverly, Massachusetts, literally burned the lower lights. They both featured rear range lights in their steeples that guided mariners to the safety of Charleston, South Carolina Harbor and Beverly and Salem, Massachusetts, Harbors. For decades they were the only churches in America with lighthouses in their steeples. The light in the steeple of St. Philip’s in Charleston has been deactivated, but the First Baptist Church steeple light in Beverly, Massachusetts is still guiding mariners into Salem and Beverly Harbors. In the United States range lights are a pair of navigational beacons lighting a safe passage for ships entering a shallow or dangerous channel or used to help mariners fix position. The beacons are made up of two lights separated by distance or elevation, so that when they are lined up with one above the other, they provide a navigational bearing. The front range light is the lowest light and the one closest to the mariner using the lights and the rear light is higher and a longer distance from the mariner. Together, they provide reliable beacons to safe harbor. Finished in 1857, the front light at Fort Sumter was a white, fifth order Fresnel lens. The guns of the Civil War destroyed the Fort Sumter light station, but Federal troops reoccupied Fort Sumter after the war and the government installed a temporary light with a steamer lens until the light could be rebuilt. The rebuilt lighthouse served Fort Sumter from 1876 to 1893, when a hurricane destroyed it. Then the Lighthouse Board replaced the tower with a light green metal skeletal tower. In 1915, after the Lighthouse Board extinguished the rear light in St. Philip’s Church steeple, it installed a radio beacon in the Fort Sumter Front Range light. From 1893 to 1915, a lantern in the steeple of St. Philip’s Episcopal Church in Charleston, South Carolina, served as a Rear Range light, working in tandem with the Front Range light at Fort Sumter. Located on Church Street in Charleston, St. Philip’s was the first Anglican Church established south of Virginia and it is one of the oldest churches in America. St. Philip’s is sometimes called the “Westminster Abbey of South Carolina” because so many distinguished men are buried in its graveyard, including John C. Calhoun, and it is on the National Register of Historic Places. The existing St. Philip’s church building was built between 1835 and 1838, and the steeple added in the late 1840s. Reverend William Dehorn was the rector of St. Philip’s Episcopal Church and Reverend William B.W. Howe, the assistant minister of St. Philip’s, when the 1861 bombardment of Fort Sumter opened the American Civil War. 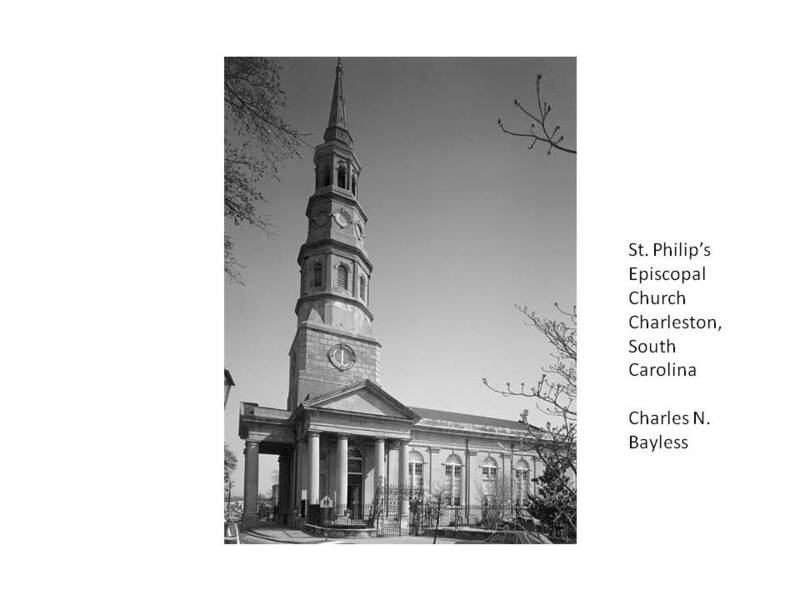 The two Southern Anglican ministers had to worry about St. Philip’s steeple during the entire war, because the Yankees manning their guns on Morris Island used St. Philip’s and St. Michael’s steeples as the fixing point for their guns that were aimed at Charleston. In 1886, a massive earthquake again put St. Philip’s and St. Michael’s steeples in peril, but both survived intact, although battered and shaken. A story in the St. Louis Republic dated November 15, 1902, reported that using the steeple as a lighthouse dates back to 1893. The United States Lighthouse Board met repeatedly with the vestry of St. Philip’s and finally persuaded them to allow a white lantern about 140 feet tall, to be installed in the upper story of the steeple to act as a range light for ships navigating through the jetties at the mouth of Charleston Harbor. The light shone powerfully and mariners thirty miles out at sea could easily see it. Mariners heading for Charleston Harbor at night scanned the horizon for St. Philip’s light, and as soon as they saw it, they would get in line with the Fort Sumter beacon and make a straight run for the mouth of the jetties and through them into the safety of Charleston Harbor. In 1902, T.J. Riley, the old sexton of St. Philip’s Church for more than fifty years, tended the light in the church steeple. Every evening at sunset and in all kinds of weather, he climbed the high and narrow winding staircase of the old steeple and lit the beacon on top of the steeple. In 1902, T.J. Riley was 70 years old, and he found that his joints often creaked and protested at every step, but every evening he still climbed the stairs to light the beacon. In 1910, the United States Light House Service took over the duties of the United States Light House Board, and ordered a general remodeling and revamping of the lights across the country. In 1915, the Light House Service deactivated and removed the light from St. Philip’s steeple, but the steeple itself still soars above Charleston as an architectural and historical landmark. Today mariners approaching Charleston Harbor use the Fort Sumter Range as the main approach channel to Charleston Harbor. The Fort Sumter Range front light is near the fort and its rear light is located in a tower near the site of the old Fort Ripley Shoal Light. For decades, Beverly, Massachusetts, boasted an active fishing and trading port, but it took the maritime commerce in adjacent Salem to motivate The Lighthouse Board to establish a lighthouse at Hospital Point – so named because a smallpox hospital had once stood there - on the north side of the channel to Salem Harbor. On May 1, 1872, a temporary light shone at Hospital Point and by the next year the Lighthouse Board had built a keeper’s house and outbuildings. Only five keepers kept the Hospital Point Light in the 76 years between its installation and its automation in 1947. Joseph Henry Herrick served as Hospital Point Light Keeper for the 43 years between 1873 and 1917. A native of Beverly and a Civil War veteran, he had worked as a shoemaker in his hometown before he became Hospital Point Light Keeper. Joseph Henry Herrick never received a pay raise from the Lighthouse Service and he never missed a day of work while he kept the light and raised his family in the keeper’s house. When he retired in 1917, he noted that his salary had stayed the same as it had been when he started in 1874, except for a small food allowance. The Beverly Historical Society preserved several of Joseph Henry Herrick’s lighthouse journals which besides routine weather entries contained notes about life at sea and in his home town. Joseph entered the names of nearly everyone who visited the lighthouse, but he didn’t write his own name in his journal even once. The United States Lighthouse Service made the Hospital Point Light a Range Front light on May 1, 1927. 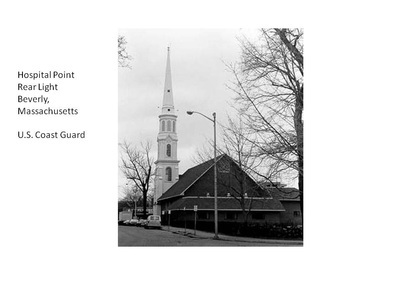 The Lighthouse Service adapted discarded lightship equipment to create a Rear Range light and installed it in the steeple of Beverly’s First Baptist Church, a mile away. Workers lined up the additional light with the Front Range light to provide an added guide for Salem Harbor. The light stood 127 feet above high water and shone through a steeple window. In 1939, the United States Lighthouse Service merged with the United States Coast Guard which took over maintaining and operating all United States lighthouses and lightships. In 1941, the United States Coast Guard remodeled the Hospital Point keeper’s dwelling to include barracks for twenty men and in 1947, the Coast Guard automated the lighthouse. The lighthouse provides a home for the First District Commander and his family. 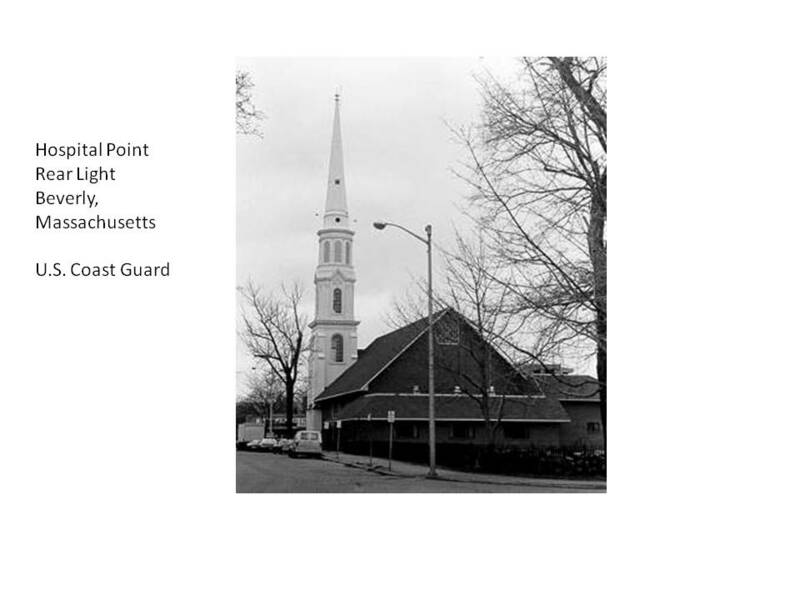 In 1975, a devastating fire destroyed the First Baptist church of Beverly, but the rear light continued to operate because the steeple was one of the few parts of the church that survived the fire. Brown, Edward. Guardian of the Flame: The Story of Hospital Point Lighthouse Keeper Joseph Henry Herrick. D’Entremont, Jeremy. The Lighthouses of Massachusetts. Beverly, MA: Commonwealth Editions, 2007. "Hospital Point Light, Beverly, Massachusetts." Publication of the U.S. Coast Guard, 1980. Holland, F.R. America’s Lighthouses: Their Illustrated History Since 1716. Green Press, 1981. Stevenson, D.A. The World’s Lighthouses Before 1820. Dover, 1960. United States Coast Guard, Aids to Navigation. Washington, D.C.: U.S. Government Printing Office, 1945.